The current narrative from Cameron and Obama is simple: the head-chopping Islamic State is a threat to all of humanity, so western forces need to return to the Middle East. Yet this narrative is far from supported by the empirical evidence. Non-existent weapons of mass destruction and non-existent Islamic fundamentalist jihadists were used to justify the invasion of Iraq in 2003 by George Bush and Tony Blair. Iraq was transformed from secular totalitarianism to chaos: in turn, chaos and opposition to occupation seeded a jihadist movement. Western support for opponents of Assad in Syria gave the so-called 'Islamic State' an opportunity to take territory. ISIS was able to seize huge quantities of heavy weaponry supplied by the USA and its allies. Thus, if US intervention has created or at least massively accelerated the growth of a monster, critics argue that more intervention will no doubt provide the Islamic State with more weapons, more support and more chaos on which to thrive. Another reason for doubting the narrative is the fact that the most successful opponents of ISIS are not only unsupported by the west but are effectively at war with a NATO ally. If the 'war on terror' was real, the words Kobane, Rojava and YPG would be on our TV screens more often than a marriage date with George Clooney. In fact, few of us have much knowledge of the forgotten war in the Middle East. This is a war that ISIS, up until a few days ago, was losing. But a NATO country has joined to help defeat not the jihadist beheaders, but their most feared opponents. As I write, the city of Kobane in the mostly Kurdish city in northern Syria is under threat from ISIS, who have laid siege to the city for over a fortnight. ISIS forces from all over the region, equipped with tanks and missiles stolen from Iraqi forces supplied by Qatar and the USA, have sustained a huge attack on this city on the border of Turkey. You won't hear about Kobane on much of the media and not so far in speeches from Obama and Cameron. These are the Kurds the west does not support, and mentioning their very existence is virtually an existential threat. The Kurds, who are said to be the largest stateless nation and are spread across Turkey, Syria, Iran and Iraq, have been fighting for autonomy for decades. The Kurdistan Workers Party (PKK) in Turkey saw their leader Ocalan captured in 1999. He remains in prison. In Syria, as a result of the civil war, the Kurds have created an autonomous self-governing republic, made up of three cantons, one of which is Kobane. The three cantons are known collectively as Rojava [western Kurdistan]. For several years the Rojavans have been fighting and beating ISIS and other jihadists like the Al Nusra front. When ISIS threatened thousands of Yazidi in Iraq, killing many and forcing others into apparently slavery, this triggered international outrage. It is largely forgotten that the People's Protection Units (YPG), the community self-defence force from Rojava, crossed to Mount Sinjar and rescued many Yazidis. While Rojava is known as a Kurdish territory, political and religious pluralism is strongly promoted. Syriac Christian militias are allied with the YPG, which also draws in Arab and Armenian fighters. Most Kurds are Sunni Muslims, although others are Yazidis. The Kurdish Democratic Union Party (PYD) is usually seen as a sister party of the PKK but there are many other Kurdish and non Kurdish political parties in Rojava. The PKK affiliated party advocates political diversity, feminism and self-governance. Originally a Marxist-Leninist organisation, remarkably the PKK sees itself as an anarchist political organisation inspired by the ideas of the American social ecologist and green anarchist, Murray Bookchin! An anarchist from North London who visited Rojava noted that they are carrying out an almost unique democratic experiment: 'We went to a meeting of one the communes based in the neighborhood of Cornish in the town of Qamishlo. There were 16 to 17 people in the meeting. The majority of them were young women. We engaged in a deep conversation about their activities and their tasks. They told us that in their neighborhood they have 10 Communes and the membership of each Commune is 16 people. They told us “We act in the same way as community workers including meeting people, attending the weekly meetings, checking any problems in the places we are based, protecting people in the community and sorting out their problems, collecting the rubbish in the area, protecting the environment and attending the biggest meeting to report back about what happened in the last week”. In response to one of my questions, they confirmed that nobody, including any of the political parties, intervenes in their decision making and that they make all the decisions collectively.' Others have termed Rojava the Chiapas of the Middle East, in reference to the Zapatistas of Mexico. The Rojava Charter, a kind of constitution, is a remarkable document. It states, “[w]e the peoples of the democratic self-administration areas; Kurds, Arabs, Assyrians (Assyrian Chaldeans, Arameans), Turkmen, Armenians, and Chechens, by our free will, announce this to ensure justice, freedom, democracy, and the rights of women and children in accordance with the principles of ecological balance, freedom of religions and beliefs, and equality without discrimination on the basis of race, religion, creed, doctrine or gender, to achieve the political and moral fabric of a democratic society in order to function with mutual understanding and coexistence within diversity and respect for the principle of self-determination and self-defense of the peoples….The autonomous areas of the democratic self-administration do not recognize the concept of the nation state and the state based on the grounds of military power, religion, and centralism”. The feminist part of their ideology reflects a strong commitment: in fact 30% of YPG members are women, all-woman fighting units (YPJ), are common, and women share the highest military rank with men. Rojava offers the threat of a good example. A self-governing anarchist society with ecological aspirations may or may not be the utopia it sounds like, however the west has little time for alternatives to capitalism that might just work. The allies of the US and UK tell us all we need to know about their war on terror. These allies include Saudi Arabia, which beheads citizens on a regular basis, outlaws LGBT people, doesn't allow women to drive and like ISIS, does not tolerate churches, Shia mosques or the advocacy of religions other than the most constrained form of Islam. Like Saudi Arabia, Qatar has funded jihadists, and then we come to Bahrain which has been heavily repressing their population. The roll call of allies is a list of shame, which includes some of the most repressive states on our planet. It is an oil-soaked catalogue of monsters. The Kurds currently armed and supported by the US in Iraq belong to a rival political organisation to the PYD. The suspicion is that Islamic State attacks, which were moving in on the shopping malls and US centres in Iraqi Kurdistan, prompted the US intervention. For, however loud the calls are to oppose ISIS, the YPG who so far have been the most effective opponents of jihadism are largely ignored. Turkey, another NATO ally, has been accused of supporting ISIS, as part of its longstanding conflict with the Kurds. Turkey has refused to fight ISIS, their border has been porous to jihadists wishing to join ISIS and the recent release of over 49 Turkish hostages by ISIS has been met with a suggestion of a deal between Turkey and the so-called Islamic State. Turkey has been strongly repressing the Kurds, and has argued for a buffer zone, which would essentially remove Rojava and replace it with Turkish troops. Turkey has also attempted to prevent thousands of Kurds from crossing the border to fight ISIS as they besiege Kobane. It has been alleged that $800 million of oil has been sold by ISIS in Turkey. There is also evidence that Turkish troops have been training ISIS. ISIS are currently concentrating their forces against their most effective opponents, the YPG and its independent democratic cause. In Kobane, the forces of ISIS terror, against which the west is supposedly at war, are at the door and massively outgun the besieged Kurds, thanks to the help of the west and its allies. The dark ironies of geopolitics cannot be made clearer: ISIS is armed with weapons captured from the US, who flooded the region with weapons, while Turkey, a NATO member, is further strengthening the terrorism against which NATO has declared war, by repressing a democratic movement fighting indigeounously against ISIS. There have been reports of US attacks on ISIS positions near Kobane, but there is some debate as to whether these have been effective. 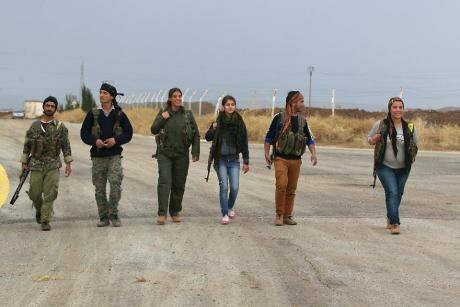 Meryem Kobanê, Commander of the YPJ (Women's Protection Units) in Kobane, noted on Saturday, September 27, that the strikes missed the ISIS forces. The US and UK intervention has brought nothing but misery to the Middle East. The silence from Obama and Cameron regarding Turkey's repression of the Kurds, shows that the 'war on terror' is more about the rhetoric than reality. All of us who want to see societies based on pluralism, self-governance, respect for minorities and empowerment of women, need to confront our elected leaders over their failure to challenge Turkish opposition to Rojava. A victory for the Kurds and their allies in Rojava is a victory for all who want a future that is dictated neither by fundamentalists nor imperialists.